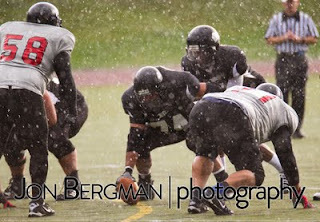 Torrential rains and crashing lightning can not stop the Blitz from scoring. The Bellingham Blitz ended the 2011 Western Washington Football Alliance season for the visiting Tacoma Invaders Saturday, July 16 at Civic Field with a dominating win and claim the top spot heading into the playoffs. The Blitz offense started hot and stayed hot, moving the ball up and down the field easily behind their tenacious offensive line. They capitalized on short fields and turnovers caused by their defense, which lived up to their reputation of punishing opponents, holding the Invaders' offensive to only two scores the entire game. Blitz coach Brian Young continues his QB rotation utilizing Cody Oakes and Leon Lilly in a wide receiver/quarterback combination that keeps both players on the field at one time and keeps opposing defenses guessing. The Invaders ran out of gas and ran out of player as several Invaders suffered injury. Final score: 61-12. Click here to view photos of the game.